My computer crashed and I have reinstalled MD 2017 but have no accounts etc shown as yet. It shows that my syncing is via drop box but I do not seem to be able to sync or or find my accounts etc. Any help would be gratefully received. If your PC is the secondary sync PC, then you probably need to re-connect to Dropbox. and I downloaded Money dance again. I entered my registration code and attempted to sync with Dropbox . I chose the folder to do this (which I am unable to change) andI am not able to sync in order to retrieve my accounts etc. I have uninstalled and reinstalled the programa couple of times but each time I the sync option it has automatically been filled and I am unable to change it from my previous choice. I am a fellow user. I'm assuming you do not have any backups of the data. Have you followed the instructions in the following article for setting up what it calls the second computer. Can you post a screen shot of the syncing window. This may help in understanding your issue. Apologies for the delay in replying. The problem I have is that my hard drive crashed and I needed to download a new copy of MD 2017. I have copies on my I Pad and Android phone which still sync via Dropbox between themselves. The info I have via support - It is very important that you ensure the data file you'd like to sync with is not already located in any shared folder (like Dropbox, Network Share, etc) before syncing is setup. But that is where the file was and is. If I were to disconnect syncing via dropbox on the mobile it states data will be lost. I have uninstalled MD and re-downloaded it but on start up it automatically defaults to sync method dropbox folder which I am unable to change. I think I need a full clean uninstall but??? From you screen shot it is clear that the data set is for a secondary computer not the primary computer. Hence you cant change the syncing method. You can convert a secondary data set to a primary data set as follows. Create a backup using the File --> Export Backup. 1. In Moneydance, select Window --> Python Scripting. 2. In the window that opens, select 'Open Script' then navigate to the .py file wherever you saved it on your system. 3. Select 'Run' to execute the file. 4. Wait a few moments until you see a message on screen, confirming the script has run successfully. 5. Close Moneydance and then reopen it. You should now have recovered your data set and be good to go. Since my last email I found a backup file dated 22nd June 2018 on my external backup hard drive (we moved address) I restored it to the newly downloaded moneydance program on my computer. All the files seem to be restored albeit some transactions since that date are not shown or differ slightly but in the sync dialogue box this now states don’t sync and lists the other options. If I now setup for Dropbox folder or connection will this override the up to date data I have on my Ipad and Mobile or will I get lucky and have the reverse happen? The mobile apps don’t allow export in settings. Thank you for taking the time to help resolve my problem it is much appreciated. Frankly I am not sure, it may be OK. In any event I would make a copy of your Dropbox “.moneydancesync” folder as a precaution. If it was me, I would in Moneydance try the following. Its worked for many others. Recover data from the “.moneydancesync” folder in Dropbox Moneydance 2017. In Dropbox make a copy of the folder “.moneydancesync” with a different name and store in a safe place. 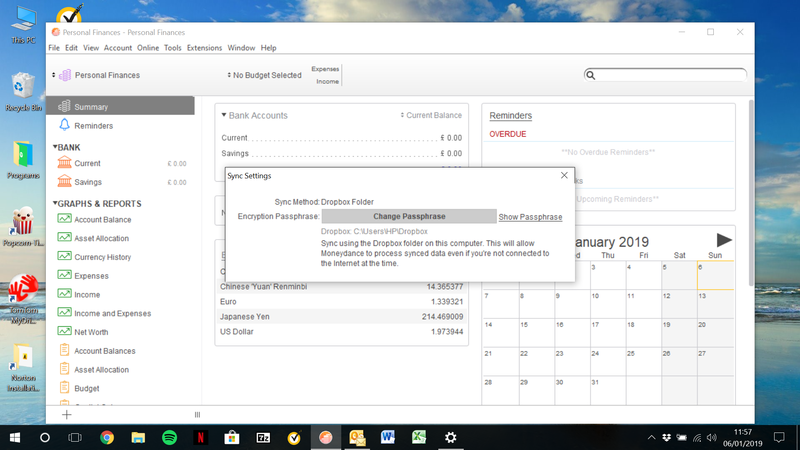 In Moneydance click FILE – NEW – OPEN SYNCED FILE. Use the dropdown to set the same sync method as you were using. Enter the same passphrase as before and start syncing. If your data set is synced back into your computer you may need to tidy things up. Particularly the things listed in the side bar. Use the “+” at the bottom. You will probably find under FILE – SYNCING that you can’t set a syncing method so you need to convert your data set as below. Create a backup using the FILE - EXPORT BACKUP. In Moneydance, select Window --> Python Scripting. In the window that opens, select 'Open Script' then navigate to the .py file wherever you saved it on your system. Select 'Run' to execute the file. Wait a few moments until you see a message on screen, confirming the script has run successfully. Close Moneydance and then reopen it. I haven't gone through the whole of the above process as yet but I think I am connected /syncing my computer with drop box. I certainly connected to it through the sync file and that very long code after allow access to drop box etc. I am syncing my mobile and i pad together but not with the computer. if support get round to replying, is there a problem we don't know about? I have started manually transferring / copying individual transactions from mobile to computer. Its very difficult for me to comment as you don’t actually explain what you have done in detail. Did your up to date data sync back to your computer? If so, did you perform the steps to convert the recovered data set from a secondary to a primary data set? Both my I pad and mobile show all accounts right up to date but not so the computer . On closing it retains files to archive and states syncing. I am not sure that the info on drop box is up to date although that said the I pad and mobile still sync to each other apparently via drop box. I did copy the sync file on the online drop box and renamed it backup sync but that was on the 6th of Jan. I will now follow your advice completely but will keep my ipad and mobile switched off. They currently hold the full up to date info. Sorry Derek and anyone else out there. Derek has really spent some time trying to help me and I am truly grateful. I have tried numerous times to follow his instructions but each time I try to connect via open synced file my screen shows not connected. I still sync with and between the mobile units but not the computer. It is really becoming a pain. Even if i individually copy all transactions from my mobiles to the computer (I will be really old by then) I am not sure how to continue syncing them they only talk to each other. I am loath to disconnect them from drop box because it states I will lose all data. You are jumping ahead expecting your computer to line up with your phones at this stage. The steps I have given you were to recover your data set from Dropbox and convert that data set from a secondary data set to a primary data set. Assuming you can now change the sync method under syncing it’s time for the next stage to reset syncing to your mobile devices. If you have transactions on your mobile devices that are not on your computer they will be lost, manually add them to your computer first. On both your mobile devices using there setting menu disconnect. Set Moneydances “Sync Method” to “Don’t Sync” under FILE – SYNCING, then click OK.
Use FILE – EXPORT BACKUP to save a backup in case something goes wrong. Then shut down Moneydance. If you are using Dropbox as the backup location wait till the Dropbox icon states “Up to Date”. This can take some time. Using your computer, in the Dropbox folder delete the folder “.moneydancesync” after taking a copy. Watch the Dropbox icon and wait till it states “Up to Date”. Open Moneydance on your computer under FILE - SYNCING, set your “Encryption Passphrase”, set “Sync Method” to “Dropbox Folder”, click OK. Wait for Dropbox folder “.moneydancesync” and its contents to be created. Check the Dropbox icon states “Up to Date”. Wait for your data to be synced. It took a while but your instructions achieved the goal. Computer, mobile and I Pad are all syncing again. It took a while to re-enter the missing transactions prior to removing the data from the mobile apps. Once again many thanks for taking the time to bear with me and point me in the right direction it is really appreciated. The program is still working as it should and that makes life so much easier. It’s just as well we have guys like him out there willing to help other users. Glad things are still going well.